COMMENT: Male and female trees. 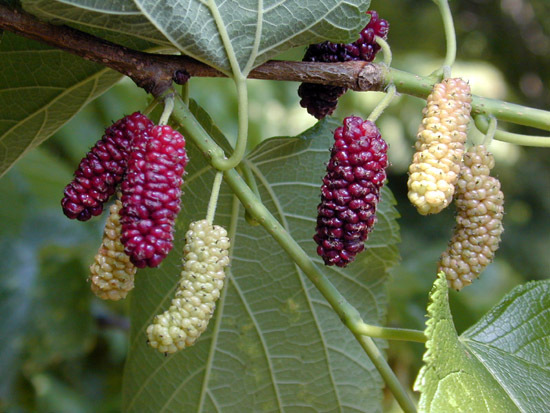 Males have catkins, females bare fruit. Fruit - raw, cooked or made into preserves. Large and sweet with a good flavour. The fruit can also be dried and ground into a powder. This is used to make a delicious confection with almonds and other nuts. The fruit is soft and juicy, when fully ripe it falls from the tree and is easily squashed. Young shoots and unfolding leaves - raw or cooked. (1) Related to fig and paper mulberry. CAUTION: Unripe fruits can cause stomach disorders. Skin contact with the leaves or stems can cause dermatitis in some very sensitive people. The milky sap in the leaves and unripe fruits can cause dermatitis, hallucinations and central nervous system disturbances. (1) This editor could find no white sap in the leaves, so uncertain about this information. OTHER USES: Fibre; Wood. A cloth can be made from the fibrous bark. Wood - coarse-grained, light, very durable, not strong, soft, rather tough. It weighs about 45lb per cubic foot and is used for boats, fencing and cooperage.